VICTORY! 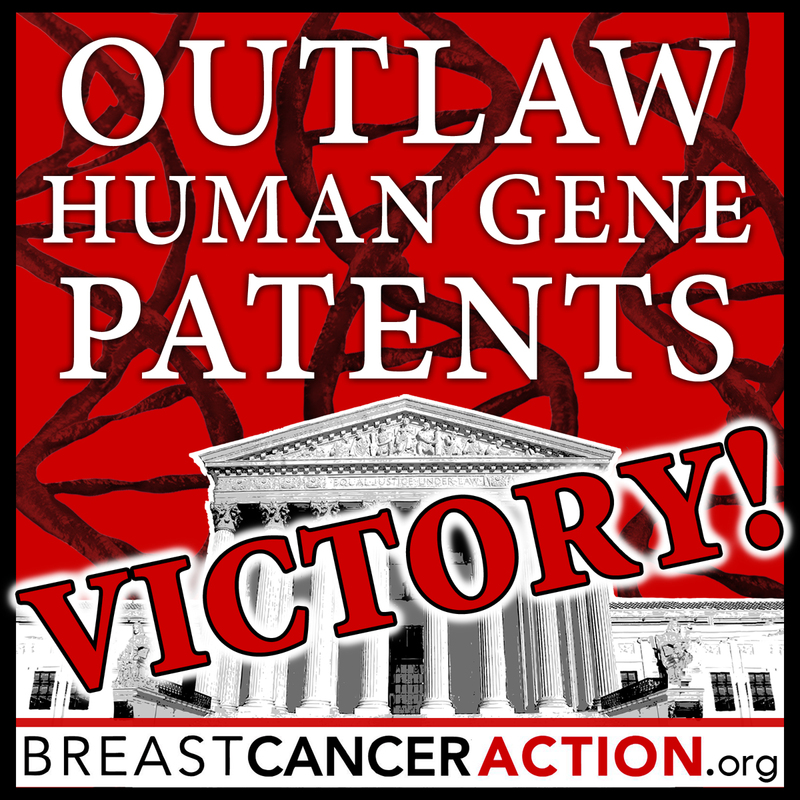 On June 13, 2013 the Supreme Court ruled in our favor to strike down Myriad Genetics’ patents on the human “breast cancer” genes, BRCA1 and BRCA2—and not just Myriad’s patents, but patents on all human genes. This is a tremendous win for women’s health – and for all our health! April 15, 2013: The U.S. Supreme Court heard oral arguments in our case against Myriad Genetics, the first time the Court took up the issue of patenting human genes. Breast Cancer Action held a rally on the Supreme Court steps during oral arguments with members from 14 states. For a recap of the rally, click here. Click here for a recap of oral arguments inside the courtroom. November 30, 2012: The U.S. Supreme Court agreed to hear the case with oral arguments scheduled for April 15, 2013. August 16, 2012: The same three-judge panel in the U.S. Court of Appeals for the Federal Circuit reached the same conclusion on Myriad’s BRCA 1 & 2 gene patents as they did in July 2011, ruling that companies can obtain patents on the genes but not on methods to compare gene sequences. The plaintiffs appealed to the Supreme Court again. March 27, 2012: The Supreme Court vacated the decision of the U.S. Court of Appeals for the Federal Circuit in light of new Supreme Court case law on gene patenting (Mayo Collaborative Services v. Prometheus Laboratories) and asked the appeals court to rehear the case. July 29, 2011: The U.S. Court of Appeals for the Federal Circuit, in a 2-1 vote, partially overturned Judge Sweet’s decision, ruling in favor of Myriad Genetics and the U.S. Patent and Trade Office. The appeals court ruled that companies can obtain patents on the genes but cannot patent methods to compare those gene sequences. The plaintiffs appealed to the Supreme Court in December 2011. 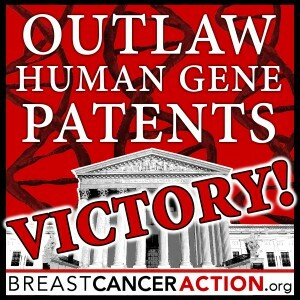 March 29, 2010: United States District Court Judge Robert W. Sweet ruled in our favor, striking down the patents on the “breast cancer” genes. Judge Sweet ruled that the patents on the BRCA 1 and 2 genes were “improperly granted” because they involved a “law of nature.” The defendants appealed. May 12, 2009: Breast Cancer Action (BCAction) joined other women’s health groups, individual women, researchers, genetic counselors, and scientific organizations representing more than 150,000 geneticists, pathologists, and laboratory professionals in challenging the legality of gene patents, specifically the BRCA 1 and 2 genes, better known as the “breast cancer genes.” BCAction is the only national breast cancer organization named as a plaintiff in the case. Since 1998, when the BRCA1 & 2 genes were first patented, BCAction has maintained that the patenting of human genes interferes with patients’ access to genetic testing and medical care and restricts much-needed cancer research.